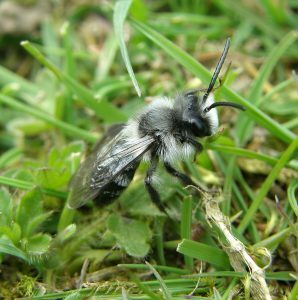 This is one of our most distinctive spring-flying solitary bees with striking black and grey/white markings. 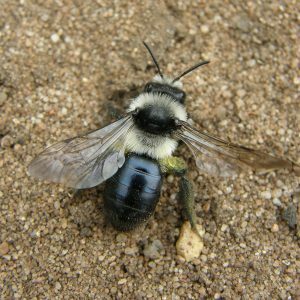 Belonging to the Andrena family of mining bees, female Ashy-mining bees excavate small tunnels in the earth to make their nests. They can occasionally be found nesting in large groups, but are also found in small groups or as single females. Males have similar markings to females, although they are smaller and not quite as noticeable. They have more obvious light hairs along the side of the thorax and also at the top of the abdomen. Females are very distinctive honeybee sized bees with a glossy black abdomen that can look blueish in the light. They have two distinct bands of light grey hair across the top and bottom of the thorax, and white hair on the face. Frequently found in various open sunny places, particularly on sites with sandy soil, including coastal areas, moorlands, river banks, open woodlands, as well as gardens and urban areas. Females create nests underground by excavating burrows in bare/sparsely vegetated earth. They feed from a wide variety of spring flowers and shrubs, including buttercups, hawthorn, blackthorn, gorse and fruit trees. Seen from March to June. Commonly found throughout most of England and Wales with records in the South West and West of Scotland. We receive lots of enquiries about this bee and other mining bees from people who have spotted lots of what look like tiny volcanoes made of earth in their gardens. This is the entrance to a female’s nest cavity. 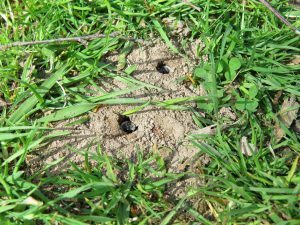 Ashy mining bees are known to close this entrance over when they’ve finished foraging for the day, and also when it rains, or if they are disturbed.